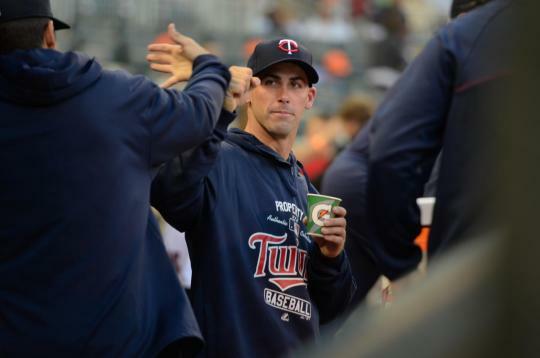 Eric Fryer is one of four catchers on the Minnesota Twins 40 man roster. We know that Kurt Suzuki will be on the Opening Day roster, but who will join him? Will it be the offensive force that Josmil Pinto could be? Will Chris Herrmann’s versatility and athleticism put him in the role? Eric Fryer knows that his defense is what gives him a chance to make the Twins Opening Day roster. Fryer became a star in high school. He attended Reynoldsburg High School where fifteen years earlier another Major Leaguer honed his skills. The player is someone that Fryer has emulated throughout his career. Matheny had a 13 year major league career and won four Gold Glove awards behind the plate. He was the catcher on two St. Louis Cardinals teams that lost in the World Series. In 2012, he was named the Cardinals manager, and in 2013, he led the team to the World Series where they fell to the Red Sox. Matheny went on to the University of Michigan. Fryer stayed home and played for THE Ohio State University. Following the 2007 college season, Fryer was the 10th round selection of the Milwaukee Brewers. After hitting .335/.407/.506 (.914) in the SALLY League in his first full season, he was traded by the Brewers to the Yankees for left-handed pitcher Chase Wright. In late June of 2009, he was on the move again, this time to the Pirates in exchange for pinch-hitter Eric Hinske. He hit .300/.391/.474 (.865) in 2010. In 2011, he moved up to AA Altoona where he hit .345/.427/.549 (.976) in 37 games. On June 26, he was called up to the big leagues and made his big league debut against the Boston Red Sox. He played in ten games for the Pirates over about five weeks before being sent down to AAA Indianapolis. In 2012, he played in six more games with the Pirates. Following that season, he became a six-year minor league free agent, and the Twins signed him quickly to a minor league deal. When the Red Wings playoff run came to an end, Fryer was one of seven players promoted to the Twins for the remainder of September. The circumstances of his promotion were very similar. Fryer played in just six games for the Twins, but hit .385 including his first major league home run, a moment he will never forget, even if it came in a game the Twins would rather forget. Fryer is known as a defensive catcher. So, what does that term mean to him? So, how does he put all of that information into action during a game? In 2013, Fryer worked with many of the pitchers that we saw with the Twins. But Fryer has a good perspective on this game. He fully understands his role as a backup catcher and dives into that headfirst. He is a guy that you can’t help but cheer for.